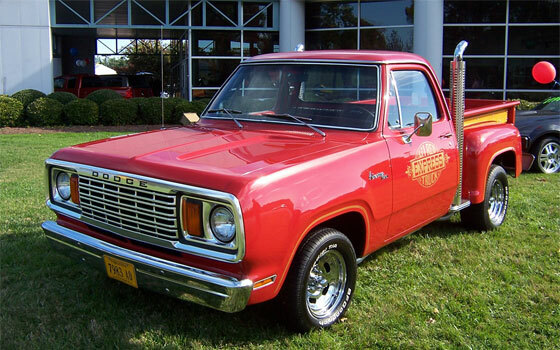 If today's pummeled economy and battered domestic auto industry echo the dreary malaise of the late 1970s, maybe the best pick-me-up would be a high-performance pickup that resurrects the American rebel spirit of the 1978-79 Dodge Li'l Red Express Truck. The Dodge Li'l Red Express Truck was an unconventional factory hot rod that took advantage of regulatory loopholes in emissions laws for light trucks that killed classic muscle cars. Chrysler sold it as part of its "Adult Toys" lineup that also included the specialty equipped and painted Dodge Warlock and Power Wagon pickups that appealed to young four-wheel-drive buyers interested in performance. Chrysler doesn't have the political or financial wherewithal to build a low-volume specialty truck today, but the aftermarket does. One of the most famous names from Dodge's high-performance history is putting his mark on the all-new Dodge Ram 1500. Norm (aka Mr. Norm) Krause has teamed up with Larry Weiner at Performance West Group to create Mr. Norm's Red Xpress Truck, a thoroughly modern take on the Li'l Red Express Truck. Throughout the 1960s and '70s, Mr. Norm ordered and sold the largest-displacement Mopars he could order from the factory at his Dodge dealership in Chicago. Before they left his lot, he tweaked their carburetors and running gear to squeeze as much power as possible from the huge pushrod motors, creating conversion legends like the GSS 426 Hemi and GSS 440 Dart. To ensure Li'l Red Express Truck enthusiasts don't doubt its high-performance intentions, Mr. 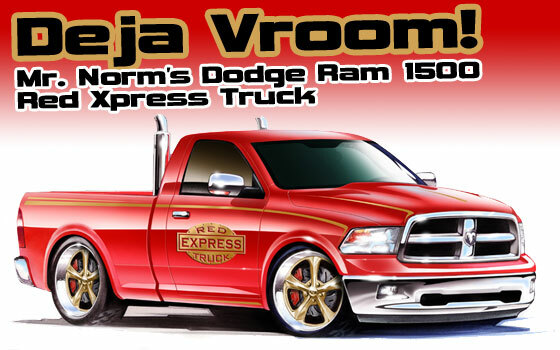 Norm's Red Xpress Truck will come standard with the Ram's 390-horsepower, 407-pounds-feet-of-torque 5.7-liter Hemi V-8, or it can be upgraded with either a 6.1-liter SRT-8 Hemi V-8 crate motor, rated at approximately 450 hp, or Mr. Norm's signature 426-cubic-inch (7.0-liter) Gen III Hemi V-8, based on the 6.1-liter, rated at approximately 600 horsepower. The 426 ci V-8 has a modified stroke with forged crank, rods and pistons. Other standard equipment will include Red Xpress Truck body graphics, a custom leather interior and floormats with "Red Xpress Truck" embroidered logos, plus 22-inch custom wheels and tires. The dual chrome exhaust stacks will be optional, as some enthusiasts may not want the intrusion of the exhaust in the bed. Those who select either of the upgraded powertrains will also find their Red Xpress Rams equipped with a six-speed manual Tremec transmission and Dana 60 rear axle. A lowered suspension, cat back exhaust and a Mopar Accessories Challenger-style twin-scoop hood will be optional across all the trucks. Even with all the powertrain tweaks, the Red Xpress is expected to fully meet California's emissions laws, the toughest in the country, so it's clean too. Pricing is estimated to start at approximately $3,599 for the base package with the 5.7-liter V-8. Option pricing hasn't been announced. The new version's inspiration, the 1978 Li'l Red Express Truck, featured a 360-cubic-inch small-block V-8 that was rated at 225 hp and 295 pounds-feet of torque. The engine was nearly identical to the motor Chrysler sold to law enforcement. It breathed through a cold-air intake and used a heavy-duty three-speed transmission. The Li'l Red Express option package also included iconic dual vertical 2.5-inch chrome exhausts, mounted big-rig style directly behind the cab; polished chrome wheels; a bright red paint job; and "Li'l Red Express" stenciled on its doors and tailgate. Just 2,188 were produced. The 1979 model was detuned and equipped with emissions hardware that lowered its performance but didn't hurt its wild looks, which were updated with dual stacked headlights. Chrysler rolled 5,188 of them off the assembly line before all Li'l Red Express Truck production was halted. Thirty years later, it sounds like happy days are here again for classic Dodge performance-truck enthusiasts. We'll keep you updated on the Red Xpress Truck's progress.